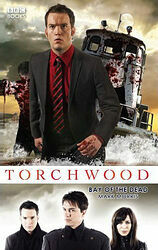 Starting in 2007, BBC Books published a regular series of original novels based on the popular Doctor Who spin-off TV series Torchwood, which debuted on the BBC in late 2006. After that, a batch of 3 novels appeared once or twice a year up to 2012, when publication of new novels went on hiatus, hopefully to return when the series itself does. Even with the absence of new novels, occasional paperback reprints of old novels does still happen. Like the Doctor Who new series novels, the Torchwood novels are all original stories — there are no "novelisations" of TV episodes.